An Illustration about the confidence of youth. The sky is the limit, The skateboarder’s pose is laid back even though he is miles above the earth. He is in the clouds, feet resting on the board which is riddled with symbolic images of his flight. The ultimate fall will happen. It is indicated by the ocean. The seed of this illustration takes a cue from Thomas Cole’s “voyage of life”, an allegory of the four stages of human life. I like The youth part, it is full of hope of the future. 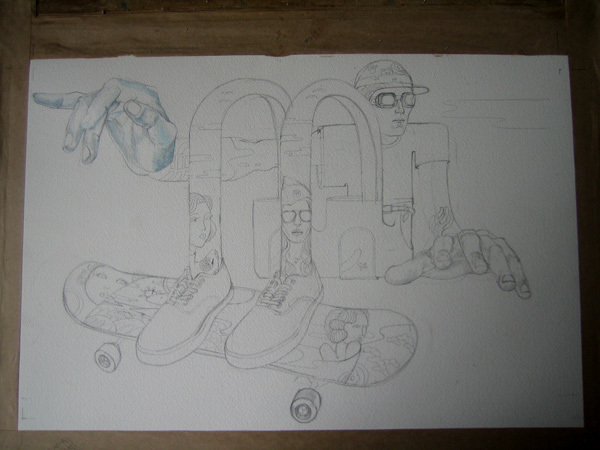 In my illustration there is only a hint of trouble ahead in the waves on the skate board and the jealous look the woman on the left leg gives the woman on the right. But now is the time of hope and dreams! Check out Ammo Magazine which I was invited to be in. Great magazine and a pleasure to be part of it. You can see the painting evolving here , but sadly I forgot to take photo’s of it after I’d finished the hands! Here is the drawing finished, as always I like to leave it overnight before starting painting as you can see it with fresh eyes and any mistakes or problems leap out at you! As i’ve said before on this blog I tend to paint in layers especially with flesh tones. I always start with cerulean blue as a base , then and a mixture of cadmium red and yellow to get a Reddy orange, apply lightly then burnt sienna and burnt umbra, but you have to be careful with those dark colours, usually a bit of messing about with cerulean blue and the cadmium red/yellow at the end. All apologies for not taking any other photos of progress of the painting; but I finished the figure and then did the sky and clouds last. Some people do the background first. I always start with the figure. When the figure is finished I start the background, and as with when I finish the drawing part I leave it over night and come back to it in the morning with fresh eyes. If mistakes happen it’s almost always because I’m in a rush or become impatient! 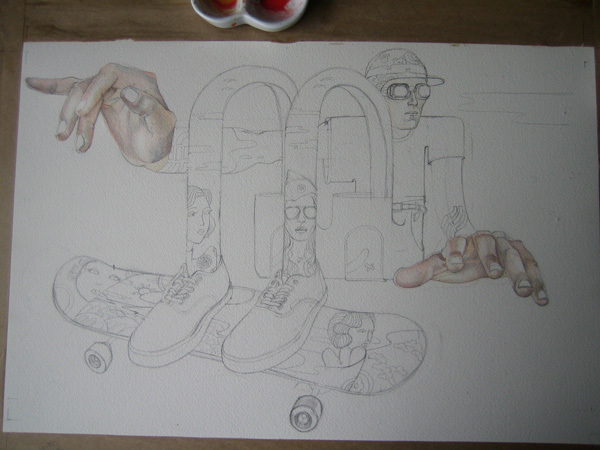 This entry was posted in Illustrations and tagged ammo magazine, clouds, japanese lady, japanese print, japanese sky, painting, pattern, skatebaord design, skateboard, thomas cole, watercolour, watercolour illustration, watercolour illustrations. Bookmark the permalink.